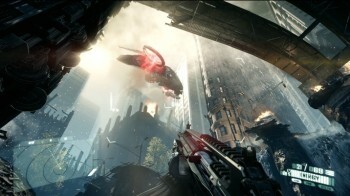 Crysis 2 Minimum Requirements "Not Official or Final"
The Crysis 2 minimum system requirements were revealed yesterday but now Crytek says they're neither official nor final. Word of the Crysis 2 minimum system requirements (for the PC, obviously) slipped out yesterday by way of the game's official German Facebook page. The hardware requirements are actually pretty forgiving, given the notoriously demanding nature of Crytek games: dual core CPU, Nvidia 8800 GT or higher, two GB of RAM and so forth. Fairly middle-of-the-road stuff. But Crytek now says that those specs aren't necessarily the bottom line at all. "These minimum specs are not official or final, we'll have an announcement about this soon," Community Manager Tom Ebsworth wrote on the the MyCrysis forums. "Please note if you didn't hear it from me/see it on MyCrysis, then it's not official :)"
It's quite possible, perhaps even likely, that this "not official" business is akin to BioWare's stance on the "speculated" Dragon Age 2 demo, but as one forum member pointed out, it's also possible that the listed specs are simply wrong. Referencing Crytek's decision to make the first Crysis a PC exclusive because consoles lacked the power to run the game properly, he wrote, "This is definitely not minimum. If consoles can run Crysis 2, but weren't able to run the original Crysis, then why would the system requirements be higher?" Still, the minimum specs posted on the German Facebook page are still there, so who knows? We'll find out soon enough either way: Crysis 2 comes out on March 22 for Xbox 360, PlayStation 3 and appropriately-equipped PCs.